Kumbhi is native to the Indian subcontinent. The name kumbhi seems to have originated from the Sanskrit word “kumbh” which means a water pot. 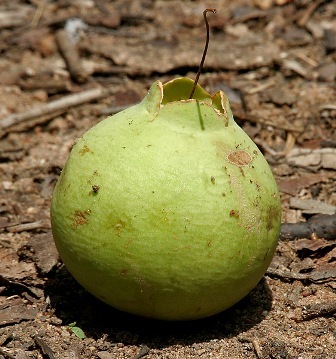 As the top of this fruit has an appearance resembling somewhat like of a water pot, so this fruit has probably named as kumbhi. 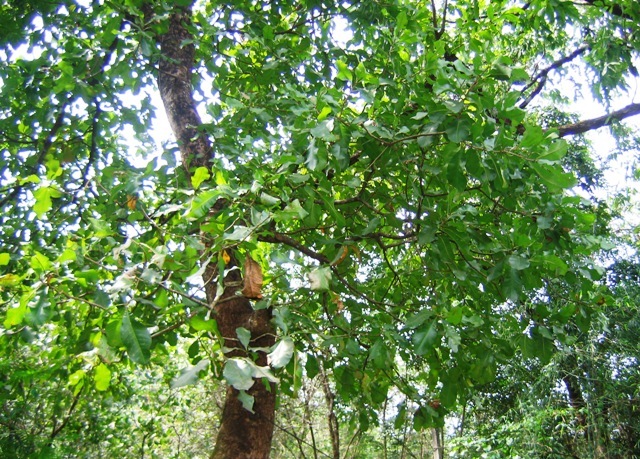 Besides India, kumbhi is also found in the forests of Afghanistan and Indochina. 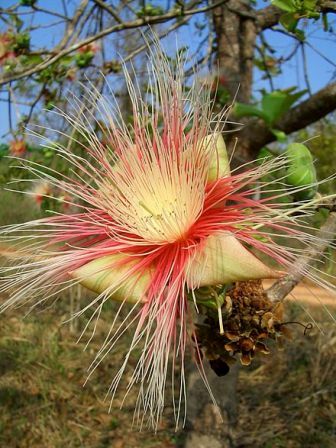 It is seen commonly growing in valleys. 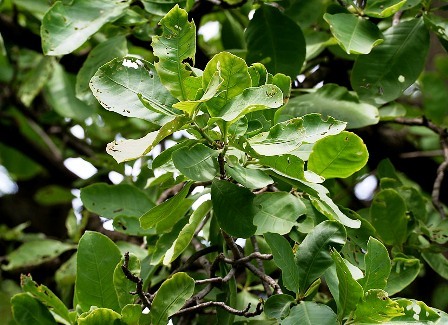 A small to medium deciduous tree, upto 12 m high, bark 10-12 mm thick, brownish, rough, exfoliations small, more or less triangular; fibrous; blaze reddish-brown, stratified; branchlets pubescent. Leaves simple, alternate, estipulate, clustered at the tips of branchlets; petiole 10 mm long, slender, pubescent; lamina 15-30 x 5-15 cm, obovate, oblong-obovate, base cuneate or attenuate and decurrent on petiole, apex round or shortly acuminate, margin crenate-serrate, glabrous, membranous; lateral nerves 10-12 pairs, parallel, prominent, intercostae reticulate, prominent. Flowers bisexual, greenish-white,, 5-10 mm across, in terminal spikes; peduncle woody; bracts 3, unequal; calyx tube campanulate, glabrous, adnate to ovary and not produced beyond the ovary; lobes 4, ovate, imbricate; petals 4, elliptic-oblong, revolute along margin, cauducous; disc annular; stamens numerous in several rows, slightly connate at base, inserted on the top of calyx; filaments subulate, purple, exserted, inner and outer rows without anthers; ovary inferior, 4-5-celled, ovules many in each cell; style long, filiform; stigma capitate. Fruit a berry, 5-7.5 cm across, globose, green, pericarp fibrous, crowned with sepals and style. 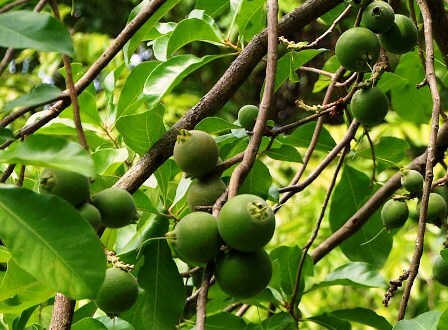 Kumbhi trees prefers a well-drained soil which may be sandy or even rocky soil. The trees requires sunny locations and do not perform well in shade. New plants of kumbhi are raised from seed which germinate within 4-6 weeks. This tree is highly fire restant. It also coppices well.